Disclaimer : I am the chap selling this book on Amazon India.I am not the publisher, but the author is a good friend and a scholar. The book “Sri Krishna Deva Raya, Amuktamalyada” is an English translation of the the medieval Telugu poem “Amuktamalyada”. This poem has great significance in Indian history and culture as it was authored by the Vijayanagar emperor Sri Krishna Deva Raya in the 16th century. The word Amuktamalyada means ” She who offered a garland after wearing it“. In this poem Krishnadevaraya unravels the legend of Amuktamalyada while expressing his innumerable ideas,personal thoughts and observations through the description of cities,towns,villages,men,women etc. The poet introduces the legends of Vishnuchitta,Yamunacharya,Khandikhya and Kesidwaja to establish the philosophy of Vishistadvaita and to teach the art of statecraft. 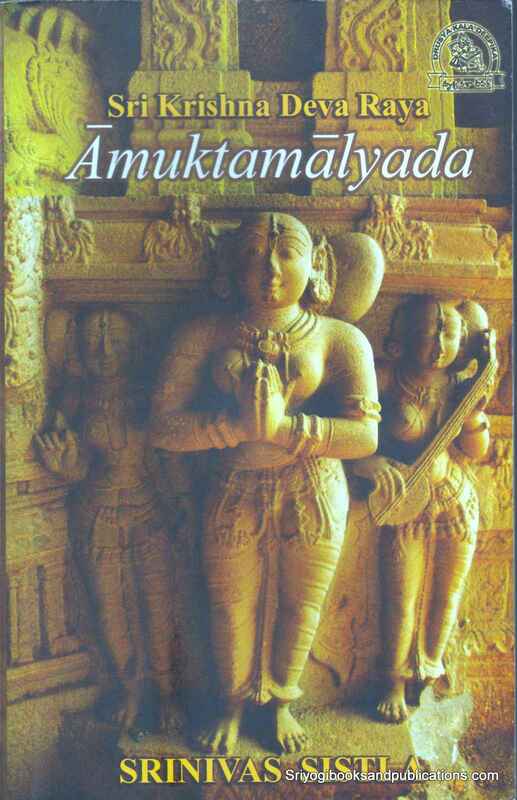 Dr.Sistla presents a near faithful version of Amuktamalyada as it is in its Telugu original.In addition to a comprehensive historical introduction and forward,Dr.Sistla has introduced many photographs and works of art along with the poem. Dr.Sistla is an Associate professor of art history at Andhra University,Vishakhapatnam. My own opinion of the book : I read the book while commuting to my job in Hyderabad a couple of years back.Dr.Sistla’s background is in art and it comes through in the book.It has 209 images linked to the content of the poem.All the images are in black and white. As I buy anything that has the label Vijayanagar on it,this book was a natural addition to my collection and I was not disappointed.Quality of translation is very high and the book is easy to read. As seen in the previous chapters the low point in the history of India came in the 1320’s. Long standing dynasties such as the Kakatiya’s of Warangal, the Seuna Yadavas of Devagiri,the Pandya rulers of Madurai were overthrown or extinguished by the Islamic war machine. The only Hindu kingdom left standing in South India was the Hoysala kingdom of Karnataka led by Veera Ballala III. The just and equitable rule of the Hindu kings was replaced by an oppressive and merciless administration. The land was parcelled out to various Amirs, Maliks and Muslim jehadi’s from around the world. These parasites sucked the blood of the common people and destroyed the traditional way of life. The terrible sufferings of the people are illustrated in the Madhuravijayam and the Vilasa grant of Prolaya Nayaka. Temples fell into disuse and the old system of endowments was discontinued in favour of extorting money from the people. With the disappearance of the agraharas the Vedic system of learning was strangulated. No sooner had the dust settled on the Tughlaq invasions that the Hindus of South India mounted a ferocious counter offensive. Out of the ashes of the fallen kingdoms arose a confederacy of Hindu chiefs, each determined to drive the Turuksha’s into the ground. The table below give the names and brief details of the prominent Hindu leaders of this great war of liberation. Chalukya Somadeva, Chalukya prince and ancestor of the Aravidu emperors of Vijayanagar Western Andhra with base at Kurnool. 1325- ? Ariyseti Annamantri Surviving general of the erstwhile Kakatiya kingdom. Coastal Andhra 1325-? Kolani Prataparudradeva Surviving general of the erstwhile Kakatiya kingdom. Coastal Andhra 1325-? Ekramnath Sambuvararaya Ruler of Rajgambhira rajyam Headquarters at Kanchipuram. Kingdom comprised of North Arcot district in Tamil Nadu and parts of Chittor district in Andhra Pradesh. 1325- ? 9.Ariyseti Annamantri 1. Mohammed Tughlaq, Sultan of Delhi.2. Malik Muhammad, governor of Kampili. 3. Malik Maqbul,governor of the Warangal division of Telanagana. 4. Shihab Sultani, governor of the Bidar division of Telangana. 5. Qutlugh Khan, governor of Devagiri (1335-1342). Table 6‑2 The chief opponents from the Hindu and the Muslim side. In Karnataka the core area around Mysore right upto Tiruvannamalai in Tamil Nadu was in the hands of Veera Ballala III. By 1328 CE, he was back in action and directing operations against the Muslim garrisons ensconced in Tamil Nadu. 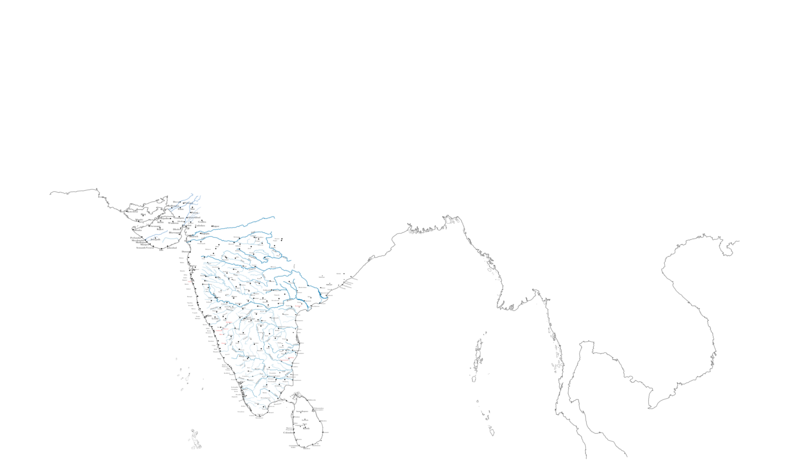 In 1327 CE, the situation was made serious by Muhammad Tughlaq shifting his capital to Devagiri from Delhi. This put enormous Muslim armies dangerously close to the Hoysala capital of Dvarasamudra. To check the danger emanating from the north, Veera Ballala entrusted the task of defending the Northern frontier of the Hoysala kingdom to the five Sangama brothers of which Harihara and Bukkaraya are the most famous.The Sangama brothers who were Mahamandaleswara’s (Provincial governors) later went on to establish the Vijayanagar empire. As a further precaution, Veera Ballala had established three capitals: Dvarasamudra,Kundani and Tiruvannamalai.This enabled him to mount a mobile defence against the Islamic incursions from Devagiri in the North, as well as secure his rear against the Muslims in Madurai. Tiruvannamalai was bang on the main road which linked Madurai to the North. For nearly fifteen years (1328-1342 CE) this city was his base of operations against the Muslim garrisons in Tamil Nadu. In the region of Anegondi and Kampili ferocious battles raged to drive out the Muslims. What was the strength of the army of Veera Ballala? From Ibn Batutas account, in 1342 CE Veera Ballala had 1, 00,000 infantry and 20,000 Muslim mercenaries in his army. In 1328 CE it is difficult to gauge his military strength, but it must have been considerable to go up against Mohammed Tughlaq. Table 6‑3 The strength of Muhammad Tughlaq’s army. Out of the nine lakh horsemen, the bulk accompanied Tughlaq on his campaigns while the rest were posted in various provincial garrisons around the country. 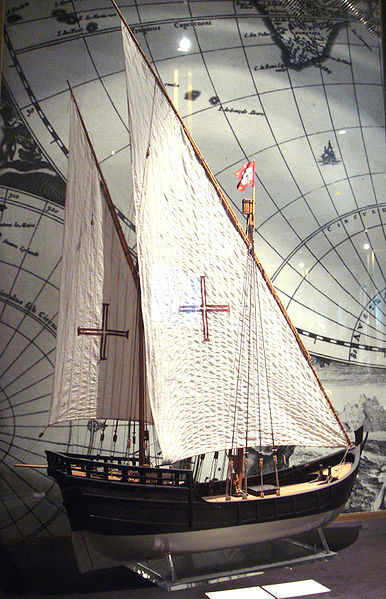 In addition he could raise large forces for temporary expeditions .e.g. sometime before 1333 CE he raised and maintained an army of 3,70,000 horsemen to support his invasion of Khorasan (in Iran).This had to be disbanded after a year due to maintenance costs running in crores of tankas ( the currency of the day). The final battle of the Kakatiya kingdom took place near Rajamahendravaram in 1323 CE. 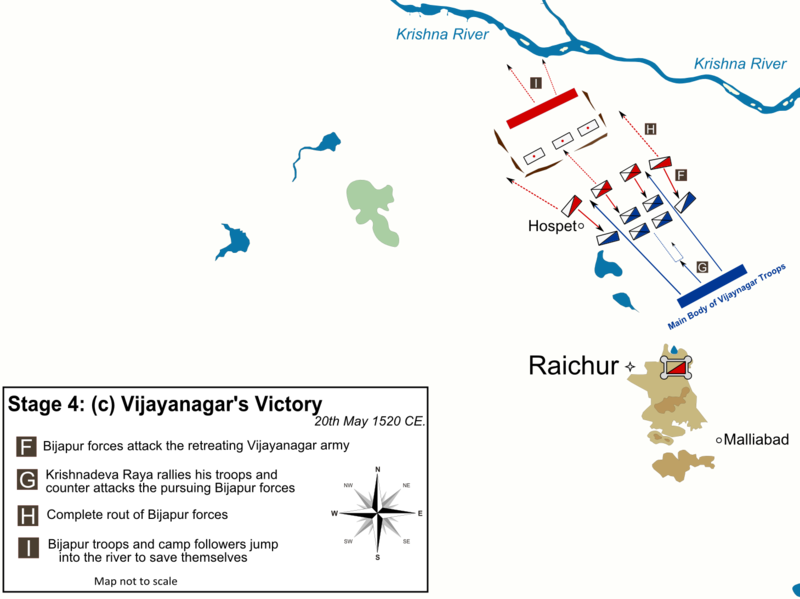 The cream of the kshatriya’s of Andhra perished in this terrible battle against Mohammed Tughlaq’s forces. But within two years of this disaster the banner of freedom was unfurled by the Musunuri chief Prolaya Nayaka and his cousin Kapaya Nayaka. With their headquarters at Rekapalli, they gathered around them 75 Nayakas (military chiefs) of the erstwhile Kakatiya kingdom. Promiment amongst the seventy five Nayakas were Prolaya Vema Reddi, Kopplua Prolaya Nayaka, Recharla Singama Nayaka and Manchikonda Ganapati Nayaka. In this heroic endeavour they were joined by surviving generals of the Kakatiya’s such as Ariyeti Annamantri and Kolani Rudradeva. Prolaya Nayaka revived the old endowments and patronised Vedic learning. He also restored those temples which suffered destruction at the hands of the Islamic invaders. This liberating army of the Hindus moved swiftly and by 1328 CE coastal Andhra was liberated from the clutches of the Muslims. In western Andhra by 1329 CE they were joined by the Chalukya prince Somadeva, who from his base in Kondanavolu (Kurnool) launched attacks on the Muslim garrisons in the Bellary and Rayalseema regions. After fierce fighting, he retook the forts of Anegondi,Mudgal,Musalimadugu,Satanikota,Etagiri,Kunti and Sara. In concert with him, Veera Ballala attacked Kampili. Malik Muhammad the Tughlaq governor of Kampili was now facing simultaneous attacks from Somadeva and Veera Ballala. Somadeva defeated Malik Muhammad in a series of battles and managed to capture him along with his 6000 cavalry. However Muhammad managed to secure his freedom by making false promises. By 1333 CE the position of the Muslims in Andhra had become precarious. The survivors retreated to Warangal which was under Malik Maqbul. At the same tine in 1335 CE, Muhammad Tughlaq descended into the Deccan to subdue the revolt of Jalal-ad-din Ahsan Shah (the kotwal of Madurai). Ahsan Shah had declared himself as an independent Sultan of Madura and minted coins in his own name. When Tughlaq was encamped in Warangal (or Bidar as per another account) a plague struck the city of Warangal .A majority of the Hindu population of that city perished along with a great part of Muhammad Tughlaqs army. Many seniors Malik’s and Amirs also perished due to the plague. Muhammad Tughlaq himself was taken sick and had to beat a hasty retreat. Ahsan Shah was left to his own devices in Madurai. By 1336 CE the stage was clear for the liberation of Warangal. Like a hurricane Kapaya Nayaka swept into Telangana and liberated Warangal in 1336 CE. 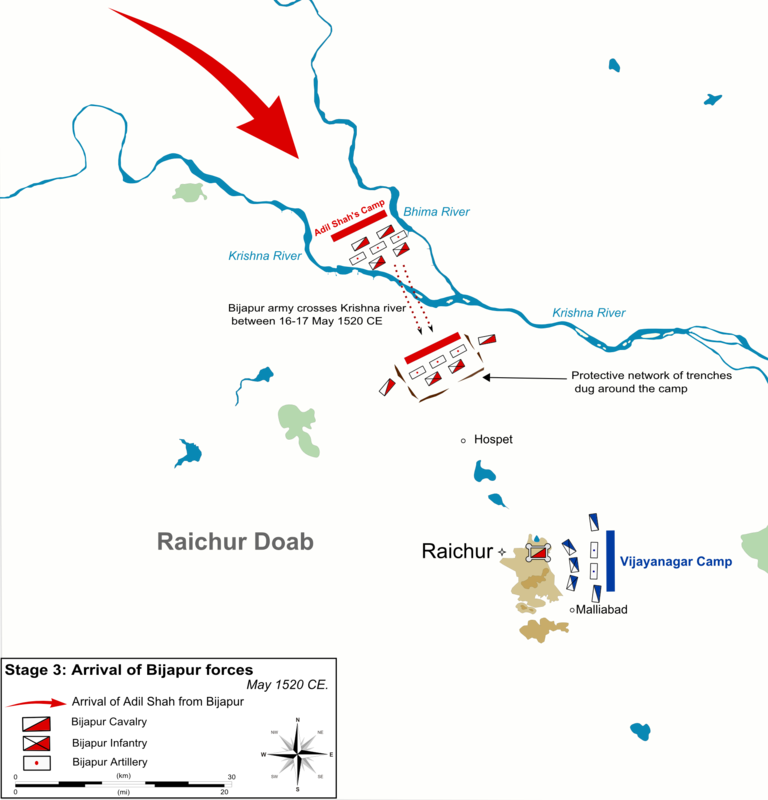 In this he was aided by Veera Ballala who sent forces to reinforce Kapaya. Warangal the declared as the capital of the short lived but glorious Musunuri kingdom. In Kondavidu, Prolaya Vema Reddi began to lay the foundations of the kingdom of the Reddi’s. The period from 1325 CE onwards was one of a general collapse of the Delhi sultanate. Till his death in 1351 CE Muhammad Tughlaq was constantly running from one end of his short lived empire to the other, constantly fighting rebellions and uprisings. By 1336 CE the major part of South India was back in Hindu hands. The only aberration was the Sultanate of Madurai in Tamil Nadu. i. Primary amongst them was to check the wave of Hindu resurgence sweeping South India. 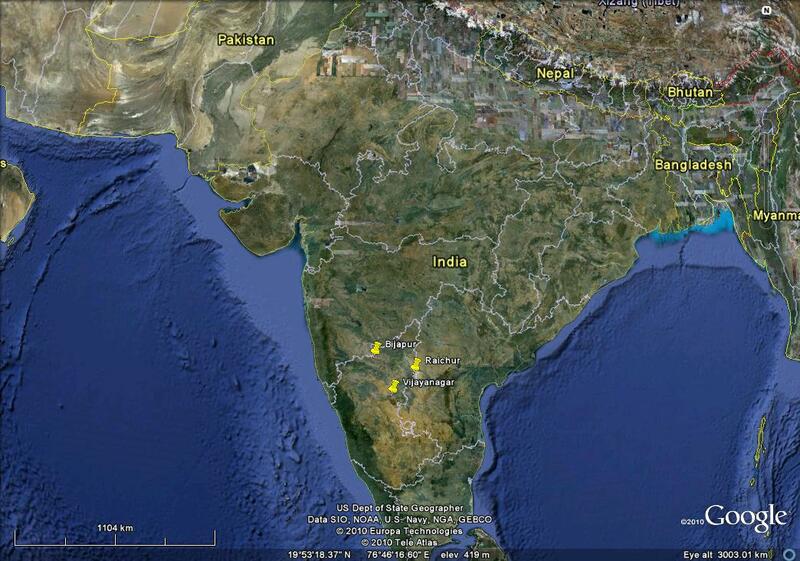 Far flung places like Madurai were six months march from Delhi. Devagiri had the advantage in being centrally located and within striking range of the main centres of the liberation struggle i.e. Karnataka and Andhra. ii. The famine in the countryside had finally affected Delhi, as the supplies of corn into the city were disrupted by chaos in the countryside.To ease the suffering of the Muslims in Delhi ,Mohammed Tughlaq ordered the evacuation of the Muslim residents of Delhi to prosperous Devagiri. The fact that it was exclusively the Muslim population that was transferred is indicated in the sources. Delhi had become a parasitical city whose prosperity depended on the exploitation of the Hindu countryside. In 1329 CE the Mongol ruler Tarmashirin swept over Delhi. 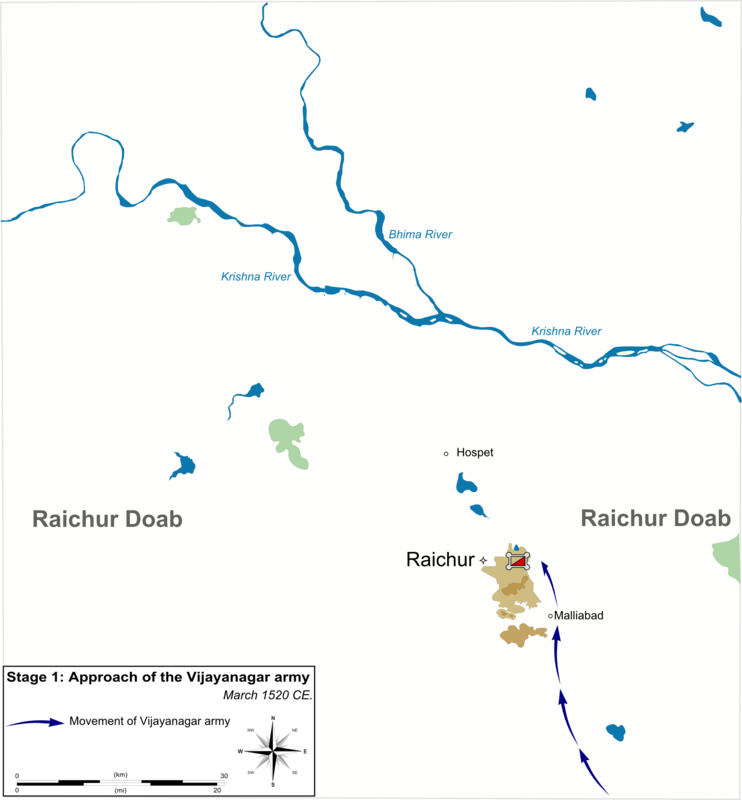 At this crucial juncture most of the officers of the Tughlaq administration were in Devagiri. Mohammed Tughlaq had to buy Tarmashirin off with a huge bribe which nearly emptied the treasury. To make up for the bankrupt state Mohammed Tughlaq issued copper coins thus effectively devaluing the currency. This led to large scale forgeries and the hoarding of gold and silver by the people. 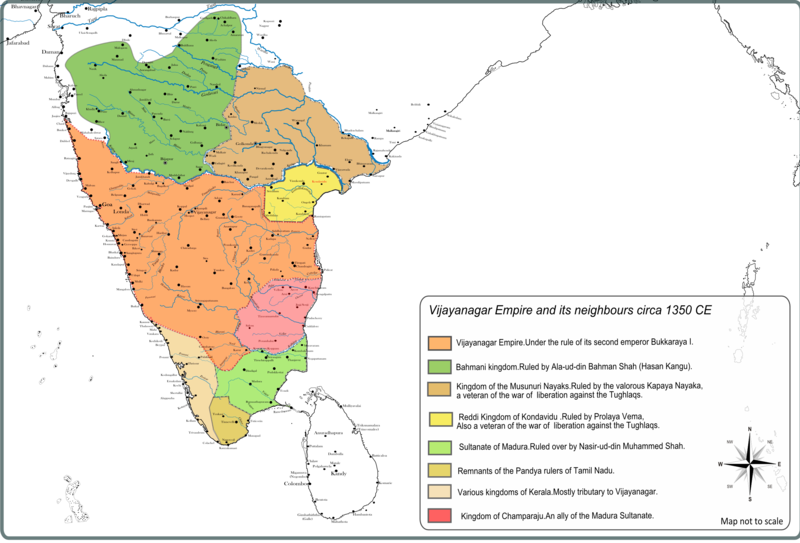 By 1333 CE rebellions had broken out all over the Tughlaq empire. The most pertinent for us is the declaration of indepence by the Jalal-ud-din Ahsan Shah; the kotwal of Madurai in 1335 CE. The heroism of Veera Ballala, the tenacious bravery of Kapaya Nayaka,the foundation of the Vijayanagar empire, its life and death struggle against the Bahmani Sultanate and the Sultanate of Madurai will form the ensuing chapters. 1. 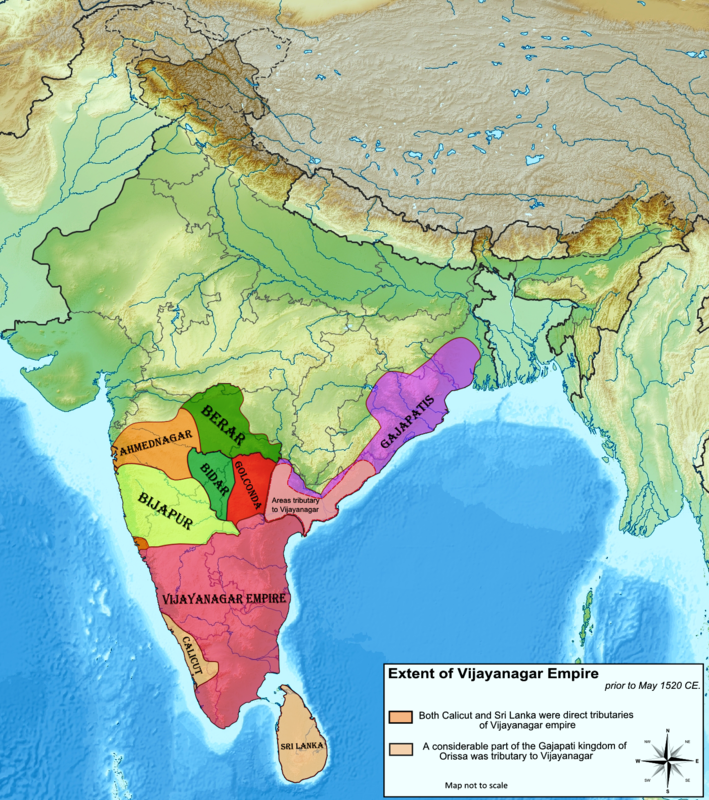 Vijayanagar,Never to be Forgotten Empire; Suryanarayan Row. 2. The Qarnuah Turks, Ishwari Prasad. 3.South India and her Muhammadan invaders; S.K.Aiyangar. 4.The History of the Reddi Kingdoms; Malampalli Somasekhara Sarma. 5. Prof.N.Venkataramanayya’s articles in Vijayanagar history in Itihaas, the journal of Andhra Pradesh State Archives,vol II,no.2,1975, Prolegomena to the Study of Vijayanagar. This article is continued from part I. “ When all the forest kings are defeated then defeating the Muslim king will not be diffuclt for you.When hundreds of branches of a tree are burnt by the forest fire,is it possible that the tree trunk will not burn?” Verse 11, Eighth Canto, Madhuravijayam. From the evidence given in the madhuravijyam it is clear that the Chola and Pandya kings who had been dispossessed by the Sultanate and its allies had taken shelter at Vijayanagar court.Madhuravijyam also hints at the fact that the kings of kerala were tributaries to Bukkaraya. Reinforced by their allies, the Vijayanagar army issued forth from the capital city like a raging torrent.The days of the adhramic Islamic sultanate were numbered now. “ The army which looked like the grand confluence of seven oceans began its orderly march with great uproar.” Verse 44, Fourth Canto, Madhuravijayam. With lightening rapidity Kamparaya’s forces reached Mulbagal in a matter of six days. From Mulbagal they swept down into Tamil country and faced off the Champaraju on the Southern bank of the river Palar near Kanchipuram. In the climactic battle Champaraju’s army was shattered and he was forced to seek shelter in the fortress of Rajgambhiranmalai. 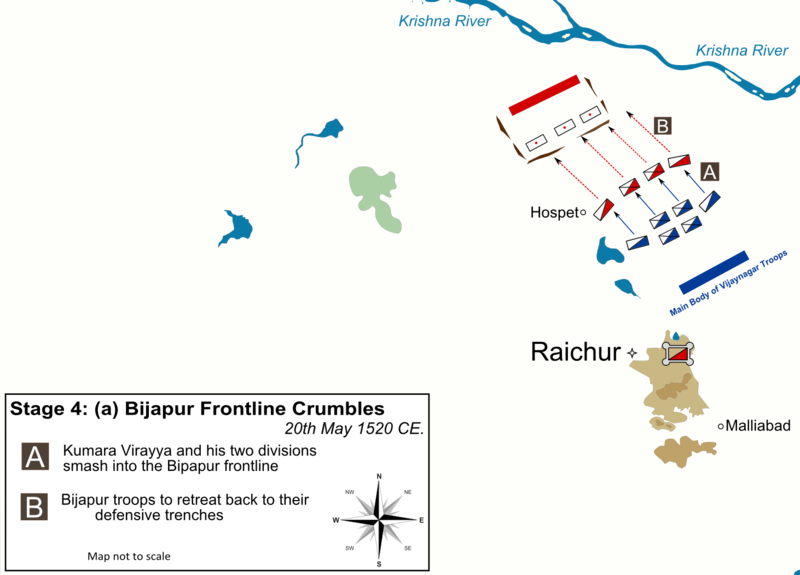 Besieged and with no succor in sight Champaraju sallied forth from his stronghold and met Kamparaya in single combat, in which he met his doom at the hands of Kamparaya. After stabilizing the anarchic condition in the erstwhile Champaraju kingdom, Kamparaya moved to attack Madurai. In this expedition he was accompanied by his Brahaman general Gopanarya (Gopanna),Saluva Mangu (who moved down from Udayagiri) and his chief minister Someya Dannayaka.The strike force under Gopana destroyed the forward Muslim garrison at Samayavarm. Srirnagam was liberated and the idol of Sri Ranganatha was reconscreated in the temple which had suffered terrible damage under the Islamic vandals. The temple of Hoysalesvara at Kannanur had been dismantled by Muslims right upto its foundations and a mosque constructed in its place. The mosque was torn down and worship restored in the temple. “ The soldiers of Kamparaya with anger ( caused by the enemies evil deeds) avoiding the shower of enemy arrows with their shields,moved unobserved and simultaneously hacked the bodies of enemy horses along with their riders.” Verse 1, Ninth Canto, Madhuravijayam. “ The bow men severed the trunks of enemy elephants with half moon faced arrows.They (trunks of elephants) fell down into pools of blood like serpents in the sacrificial fire of King Janmejaya.” Verse 3, Ninth Canto, Madhuravijayam. In the hotly contested battle nearly all the Muslim commanders were killed. in desperation the Muslim sultan attacks Kamparaya and is beheaded in the ensuing encounter. Thus curtains came down on one of the darkest chapters of Indian history. For the first time in Indian history a blood thirsty sultanate was uprooted root and branch and no trace of it left, except for odd coins discovered by numismatists centuries down the road. 3.1.2 Who was the sultan and when did this war take place? The dates for the existence and destruction of the Madurai sultanate vary widely. This is natural given the paucity of evidence and inscriptional data which can be extremely confusing. 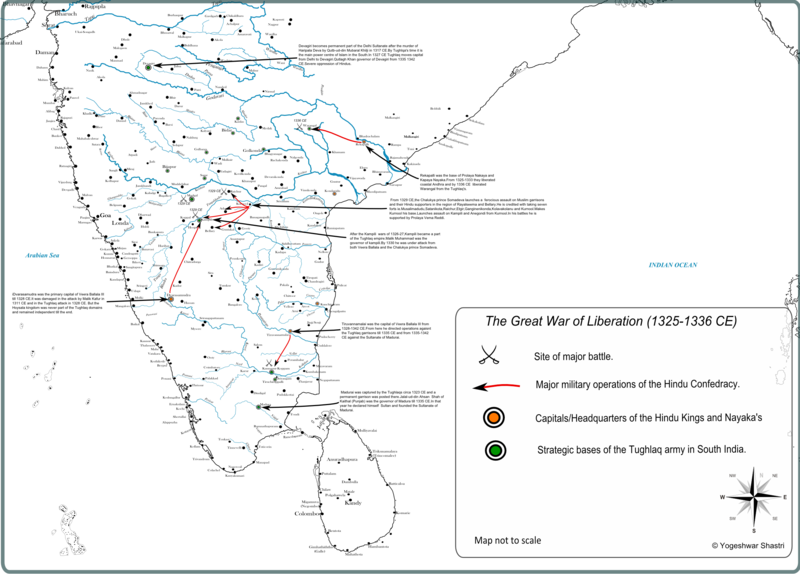 The dates for the Madurai war range from 1352 to 1371 CE, a wide range of nearly twenty years. Thus if the foundation of the Madurai sultanate is dated to 1333 CE, it could have lasted anywhere from twenty to forty years depending on which scholars argument you accept. The Bahmani sultan Ala-ud-din Hasan Kangu launched a major invasion in 1355-1357 CE which was successfully beaten off by Bukkaraya. 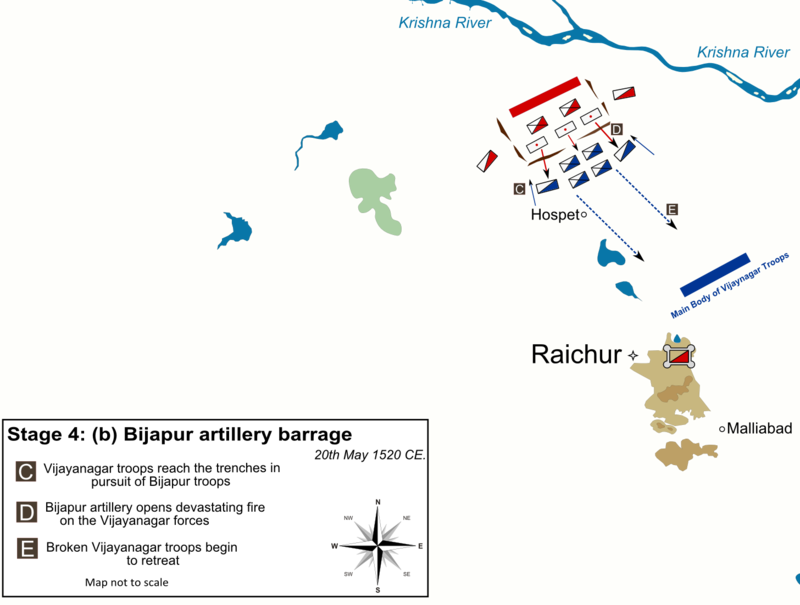 The shock of the defeat and near continuous warfare with Vijayanagar virtually emptied the Bahmani treasury. On Ala-ud-din’s death in 1359 CE,his son Muhammad I found himself broke and unable to mount a credible attack against Vijayanagar. The danger of Firoze Shah Tughlaq (Sultan of Delhi) mounting an attack to recover his brothers conquests in the Deccan also loomed large. Muhammad packed off his mother with a large bribe of gold coins to the Sharif of Mecca and the impotent Abbasid caliph living in Egypt. At this point in 1360 CE both Bukkaraya and Kapaya Nayaka of Warangal were breathing down his neck. With the tinkle of gold in his hands the Abbaisid caliph promptly issued a farman asking Feroze Tughlaq to desist from attacking the Bahmani kingdom.The farman of an impotent and powerless figurehead from the middle east was enough to convince Firoze Tughlaq to issue an assurance of non-aggression to Muhammad I. This a typical example of the mentality of Muslims in India even today where everything from the Arab world is greater than the land they live in. i. The river Krishna was recognized as the boundary between Vijayanagar and the Bahmani sultanate. ii. Prisoners of war on both sides were to be set free. iii. In future wars women and children would not be harmed and would be treated with respect. iv. 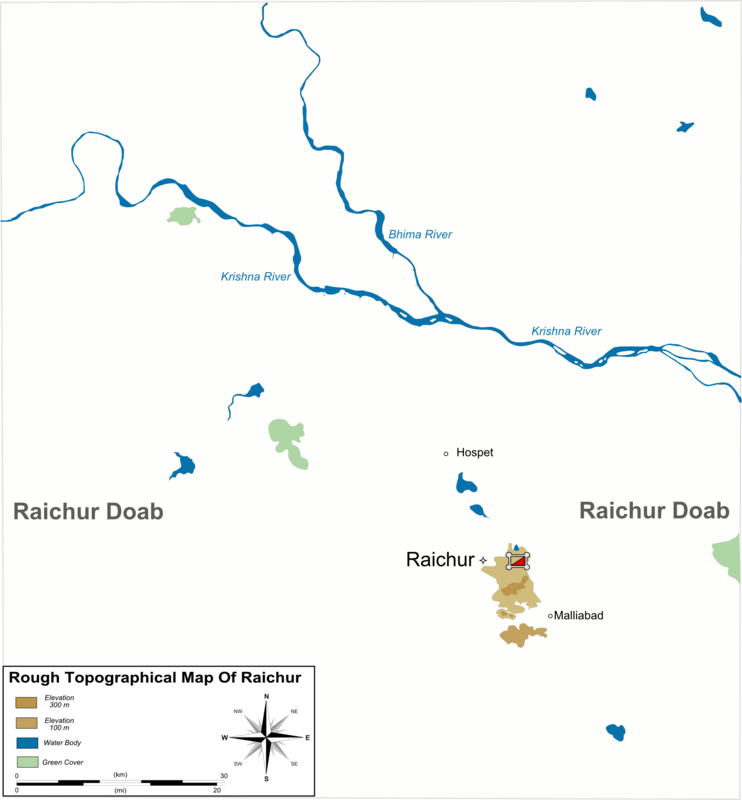 The forts of Raichur and Mudgal to be jointly controlled. The terms of the treaty clearly indicate that the Bahmani’s had received a drubbing at the hands of Vijayanagar. This war was notable for the fact that firearms including cannons and muskets were employed by both sides. For his untiring efforts in healing the scars inflicted on Hindu society, Bukkaraya was given the title “ Vedamarga Prasthapika” ie the re-establisher of the Vedas. His patronage revived the old systems of learning which had fallen into decay in a half century of warfare.An extremely tolerant ruler he mediated between various sects such as the Jainas and Srivaisnava’s extracting promises that they would respect each other. He also constructed extensive water management projects the most significant of which was the reservoir of Bukkasamudram. The old water dams, bridges etc which had fallen into ruins due to the Muslim depredations were repaired and restored. Taxes were reduced keeping in view the strained circumstances of the land. 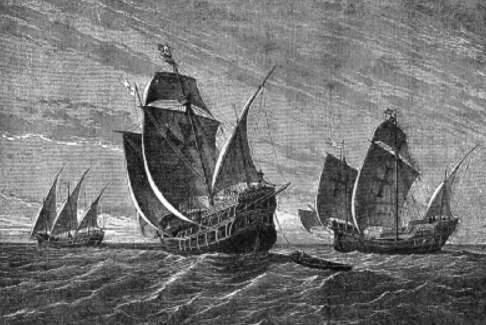 Goa which was under the Kadamba kings came under incessant attack by the Bahmani jihadis. Under Bukkaraya the Islamic invaders were pushed out and Goa was recovered. This great defender of Dharma breathed his last on 24th February 1377 after a glorious reign of more than twenty years. 1.Tamil Country under Vijayanagar rule, Dr.A.Krishnaswami,Annamalai University,1964. 2.Social and Political Life in the Vijayanagara Empire, B.A.Saletore,Vola I & II. (both are available for free download here). 3. Original translation of Madhuravijyam, to be published by Sriyogi Publications in 2013. 4.Madhuravijyam,English translation by Prof.Tiruvenkatachari,Madras University,1959. * These names have been solely based on numismatic evidence, they are not backed up by either inscriptional or literary sources. Prof. N.Venkataramanaya has correctly called into question the validity of taking these names and dates for granted solely based on the evidence of coins. On request follwing two books relating to Vijayanagar history and its foundation. Vyasayogi Caritam is a sanskrit poem written between the 15-16 Centuries on the great Madhva scholar Vyasaraya.It has an exhaustive historical forward as well.